The romantic atmosphere that lives on in this old city, located along the stunning Black Sea coast, makes Sozopol a popular seaside getaway. Sub Diving has been added to your itinerary. Start off your visit on the 24th (Sat): step off the mainland to explore St. Anastasia Isle, then make a trip to Beglik-Tash, and then enjoy the sand and surf at Perla Beach. Here are some ideas for day two: take in the architecture and atmosphere at Church of Saints Cyril and Methodius, pause for some serene contemplation at St George Church Църква Св.Георги, then make a trip to Church of The Most Holy Mother, then take in the spiritual surroundings of Armenian Church Saint Cross, and finally see some colorful creatures with Sub Diving. To see maps, where to stay, and tourist information, use the Sozopol itinerary planning website . London, UK to Sozopol is an approximately 10-hour flight. You can also drive. Due to the time zone difference, you'll lose 2 hours traveling from London to Sozopol. Expect a bit warmer temperatures when traveling from London in August; daily highs in Sozopol reach 34°C and lows reach 22°C. Cap off your sightseeing on the 25th (Sun) early enough to go by car to Sveti Vlas. Sveti Vlas, is a town and seaside resort on the Black Sea coast of Bulgaria, located in Nesebar municipality, Burgas Province. Satisfy your inner culture vulture at Church of the Holy Archangels Michael and Gabriel and Winery Messembria. Eschew the tourist crowds and head to Camel Park Sunny Beach and Turkish Baths. Venture out of the city with trips to Monastery of St. George (in Pomorie), Church of the Assumption (in Nessebar) and Irakli Beach (in Obzor). There's much more to do: admire the landmark architecture of St Stephens Church, contemplate in the serene atmosphere at Church of St. John the Baptist, visit a coastal fixture at Embankment, and see the interesting displays at Archaeological Museum. To see traveler tips, ratings, and other tourist information, read Sveti Vlas trip planner . Getting from Sozopol to Sveti Vlas by car takes about 1.5 hours. Other options: take a bus; or ride a ferry. August in Sveti Vlas sees daily highs of 34°C and lows of 22°C at night. 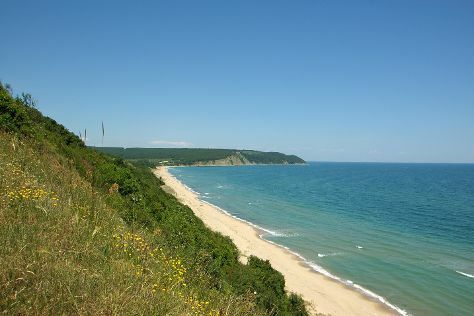 Finish up your sightseeing early on the 28th (Wed) so you can go by car to Varna. Combine historical exploration and seaside relaxation at Varna, Bulgaria's coastal Black Sea city. On the 29th (Thu), take an in-depth tour of History of Varna Museum, then examine the collection at Butterfly House Varna, then try your luck at INTERNATIONAL Hotel Casino & Tower Suites, and finally see the interesting displays at Ретро Музей/Retro Museum. Get ready for a full day of sightseeing on the 30th (Fri): take in the dramatic natural features at Pobiti Kamani, enjoy some diversion at Antique Village, and then head outdoors with Fortress Ovech. For other places to visit, where to stay, traveler tips, and tourist information, read our Varna trip planning tool . You can drive from Sveti Vlas to Varna in 1.5 hours. Another option is to take a bus. In August, daytime highs in Varna are 34°C, while nighttime lows are 21°C. Finish your sightseeing early on the 30th (Fri) to allow enough time to travel back home.